WhiteKnightTwo/SpaceShipTwo flies over New Mexico’s Spaceport America. Between commercial and government spaceflight, manned and robotic, there's a lot on next year's spaceflight docket. For NASA, this year will bring the first private space cargo missions to the International Space Station, while China plans to launch its first crew to a brand-new space laboratory in orbit. In 2012, the first of these private vehicles is set to make its maiden voyage to the orbiting laboratory. The Dragon space capsule developed by Hawthorne, Calif., company Space Exploration Technology (SpaceX) is scheduled to launch atop the company's Falcon 9 rocket Feb. 7. A few days later, the craft is due to autonomously rendezvous with the space station. When it comes within range, the astronauts aboard the station will grab hold of it with the station's robotic arm and berth it to the outpost. SpaceX depicts its Dragon spaceship's space station flight in this animation. Another private spacecraft, the Cygnus capsule being developed by Orbital Sciences Corp., of Dulles, Va., is also set to make its debut in 2012. Cygnus is due to fly atop Orbital's Taurus 2 rocket in May. Another burgeoning field of commercial spaceflight is the suborbital space tourist industry. A leader in this market is Mojave, Calif.-based Virgin Galactic, headed by British billionaire Sir Richard Branson. Virgin Galactic plans to fly paying passengers on suborbital joy rides to the edge of space and back, initially at $200,000 a pop. Virgin Galactic's vehicles, the space plane SpaceShipTwo and its mothership WhiteKnightTwo, have so far made gliding test flights. The first powered flights have not been announced, but experts are hoping to see SpaceShipTwo's rocket engines ignited for flights sometime in 2012. 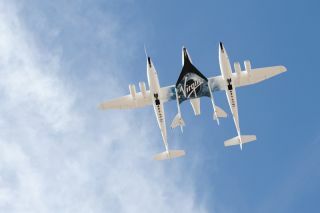 These test flights will be a major step toward flying space tourists, more than 400 of whom have already paid in full. Video still showing China's Shenzhou 8 spacecraft docked with the Tiangong 1 lab module on Nov. 3, 2011. China, a growing player in space, is working on its own manned space station. This year the nation launched its first space station test module and conducted its first in-orbit rendezvous and docking. Though these spacecraft were unmanned, Chinese astronauts are expected to fly on a subsequent docking test flight in 2012. The Tiangong-1 module, launched Sept. 29, is still in orbit. The robotic Shenzhou 8 mission launched Oct. 31 and met up with Tiangong-1 multiple times before returning to Earth in November. The next docking missions, which will further develop this critical skill for building a space station, will be Shenzhou 9 and Shenzhou 10. At least one of them will be crewed, Chinese officials have said. On Sept. 10, NASA launched the $496 million Grail spacecraft (short for "Gravity Recovery And Interior Laboratory") on a mission to map the moon's gravity, to help learn about our natural satellite's interior and formation. The twin probes are due to arrive at their target on New Year's Day. They will stay in orbit around Earth's moon for about three months, tracking the moon's gravitational field by measuring minute changes in the distance between the two spacecraft due to gravitational variations. LightSail-1 is an unmanned solar sail spacecraft being developed by the nonprofit Planetary Society, an organization that advocates space exploration. Solar sail technology offers the potential to use the sun's radiation to push a spacecraft farther and faster than traditional propulsion does. The LightSail-1 vehicle is the first of three planned tests of the technology by the Planetary Society. It is due to launch sometime in 2012. LightSail-1 is made of three small cube-shaped spacecraft attached to four triangular Mylar sails arranged like a kite. The vehicle will rely on pure sunlight for propulsion. This artist's conception shows a solar sail high above the Earth. In July, the $466 millionDawn spacecraft is due to depart Vesta and head toward the dwarf planet Ceres, the only larger body in the asteroid belt. Its arrival is set for February 2015. The probe aims to study these space rocks for clues about the history of our solar system and the formation of the planets. NASA's huge new rover Curiosity, the centerpiece of the space agency's Mars Science Laboratory mission, is expected to land on the Red Planet Aug. 6. The $2.5 billionCuriosity lifted off Nov. 26, 2011. It's the largest and most ambitiously designed Mars rover to date, packed with 10 different science instruments to search for signs that Mars is, or ever was, habitable to life. The landing is expected to be a nail-biter, as Curiosity is due to descend to the planet's surface as no vehicle has done before. NASA engineers devised a sky crane descent module that will parachute down to hover over Mars, then lower Curiosity on tethers to a gentle touchdown. The Dream Chaser is a private space plane built by Sierra Nevada Corp., of Colorado. This orbital flier is another bid to take over the task of ferrying NASA astronauts to the International Space Station. When it launches to space, Dream Chaser will fly atop a United Launch Alliance Atlas 5 rocket. But first, Sierra Nevada plans to conduct test flights of the vehicle closer to the ground during the summer. For Dream Chaser's first test flight, the space plane will be lofted to high altitudes by Virgin Galactic's WhiteKnightTwo mothership. Then Dream Chaser will be dropped so it can glide back down to the ground, to test its landing capabilities. The test flight reportedly will take place from either Edwards Air Force Base in California or White Sands Missile Range in New Mexico. The U.S. Air Force has a secretive spy spacecraft called X-37B in orbit right now. The unmanned space plane, operated by the Air Force's Rapid Capabilities Office, launched atop an Atlas 5 rocket from Cape Canaveral, Fla., on March 5, 2011. It is the second craft of its kind. There's also a chance the Air Force will launch another version of the test vehicle next year. Though details are scarce, the spacecraft is designed as a prototype robotic long-duration platform for space-based Air Force activities. The X-37B's payload is classified. An Air Force photographer snapped this profile view of the X-37B shortly after its landing on Dec. 3, 2010, which marked the end of the secret vehicle's maiden space mission. The International Space Station, though practically complete, is not quite done with new facilities and tools. The orbiting laboratory is a $100 billion, football field-size collaboration among the United States, Russia, the European Space Agency, Japan and Canada. In May 2012, Russia will launch the Nauka Multipurpose Laboratory Module (MPLM), a new room to be added onto the space station's Zvezda nadir port, replacing the Pirs docking compartment currently there. Nauka will house science experiments and cargo and will be used for docking, as well as work and rest areas for the crew. The same Russian Proton rocket that launches Nauka will carry the European Robotic Arm. This new tool will be attached to the Russian side of the space station to assist with work on the station's exterior. Many of the robotic probes currently exploring the solar system will reach milestones next year. For example, the Cassini orbiter, which has been circling Saturn since 2004, will make multiple flybys of the Saturnian moons Titan and Enceladus, as well as distant flybys of many other moons, including Helene, Mimas, Janus, Polydeuces, Telesto, Pallene and Dione. NASA's Messenger mission, which arrived in orbit around Mercury this year, will continue its up-close study of the planet closest to the sun. And the agency's New Horizons mission, which launched in 2006, will come closer to Pluto than any other spacecraft yet. New Horizons is due to reach its target in 2015, when it will fly by Pluto to study the dwarf planet and its moons. The craft has already passed the orbit of Uranus and is due to pass Neptune's orbit in 2014. Many other planetary probes will continue plugging along next year to advance scientists' goals of better understanding the solar system. It's easy to overlook because it's been happening for more than a decade, but the five partner space agencies behind the International Space Station will continue to send people to the outpost to maintain the human presence in space that's been constant since 2000. Though NASA's space shuttles retired in 2011, the agency didn't stop sending astronauts to help crew the space station, which will continue to operate to at least 2020. Twelve spaceflyers are scheduled to travel to the space station on four different launches in 2012. These men and women will spend around six months each living and working in space, performing experiments in a wide range of sciences inside humanity's only microgravity laboratory. Note: This story was corrected to reflect that NASA's New Horizons probe will make a close flyby of Pluto and its moons in 2015, not go into orbit around the dwarf planet.